From October 1863 onwards, Robert Morehead negotiated with Saul Samuel and the other landholders to jointly work the mines. Thus on 30 May 1864, the Cadiangullong Consolidated Copper Mining Company was established with a capital of £60,000. The owners of the properties received £20,000 in shares to compensate them for their interest, while the Scottish Australian Mining Company held £20,000 in shares for their capital improvements. The remaining £20,000 was to be raised as working capital through the sale of 20,000 shares at £1 each. The landowners took shares to the value of £5,000, the Scottish Australian Mining Company the same amount, the remaining £10,000 being offered to other shareholders of the company in London. The West Cadia mines were divided into the North and South Sections. The Cornish engine was finally erected on the South Section in 1865. Nearby were a smithy with two forges, a large carpenter’s shop and engine-fitting shop, with a large lathe, powder magazines and mining office. The period from 1861 to 1868 saw the peak of activity at the copper mines. It included the construction of the copper smelting works in 1861-1862, the commencement of mining in earnest in 1864 and the completion of the engine house in 1865. The copper mines attracted a large workforce, with their families and children, up to approximately 600 people, all needing to be housed and fed. Cadia Village sprang up beside the mine. This was also the period that attracted the most public attention to the remote mine. One of the first newspapers to report on the new mine was the Orange Guardian on 1 March 1865. The “Wandering Reporter” wrote in more colourful terms on 16 September 1865 in the Sydney Mail. Cadia was included in the New South Wales Gazetteer for 1866. The population of New South Wales had grown rapidly with the discovery of gold in 1851. As the miners sought other employment, once the easily won gold had given out, so settlement spread and began to encroach upon the mine itself. In 1866 the first impact was felt – large parts of the land surrounding the mine were closed to the miners and woodcutters by a pastoral lease. Josiah Holman arranged for the preparation of a petition calling for the declaration of a Common, so that fuel could be gathered for the mine. The petition was successful and ensured the viability of the mine for a number of years. Excavation of mine shafts at Cadia was based upon Cornish mining techniques, heavily reliant on manual labour. Miners concentrated on the richest lodes, using explosives where necessary to assist progress. The early smelters were built on the reverberatory principle, which could utilise timber as fuel and was simpler to build and operate. The technology had been developed in South Wales and was widely applied in copper mines across Australia. At Cadia the eight to nine stage process was simplified to a six stage process in 1861-1862. The Cadiangullong Consolidated Copper Mining Company made heavy losses in 1867, when the price of copper on overseas markets fell. Low copper prices as well as a decline in ore quality caused the cessation of production. Josiah Holman was ordered to close the Cadia mines and smelting plant in November 1867, once all ores on hand had been smelted. Holman managed to find work for the smeltermen well into 1868. In mid 1868, the mortgagee ordered the sale of the Cadiangullong Copper Mines, but there were no bids and the property remained in the hands of the company. The advert provides a succinct description of the mines. In the process of closing down the mine, Josiah Holman, Mine Manager, wrote a final report to J. H. Miller, the manager of the Cadiangullong Copper Mining Company in Sydney. On 7 September 1868 a final general meeting was held to dissolve the Cadiangullong Consolidated Copper Mining Company. A caretaker was appointed to look after the Cadia property. Robert Morehead was forced to purchase the interests of the other shareholders for £2,000, so the mines finally came into the full ownership and control of the Scottish Australian Mining Company. The closure of the mine was a devastating blow to the miners and their families, who were forced to seek work elsewhere. Always with a watchful eye out for the interests of his fellow miners, Josiah Holman could not immediately provide any solid alternatives. However in 1870 he applied for a lease of the Cadia properties on the basis of 10 percent commission on all gold and copper raised. While this provided some hope, it was not enough to keep the community together. 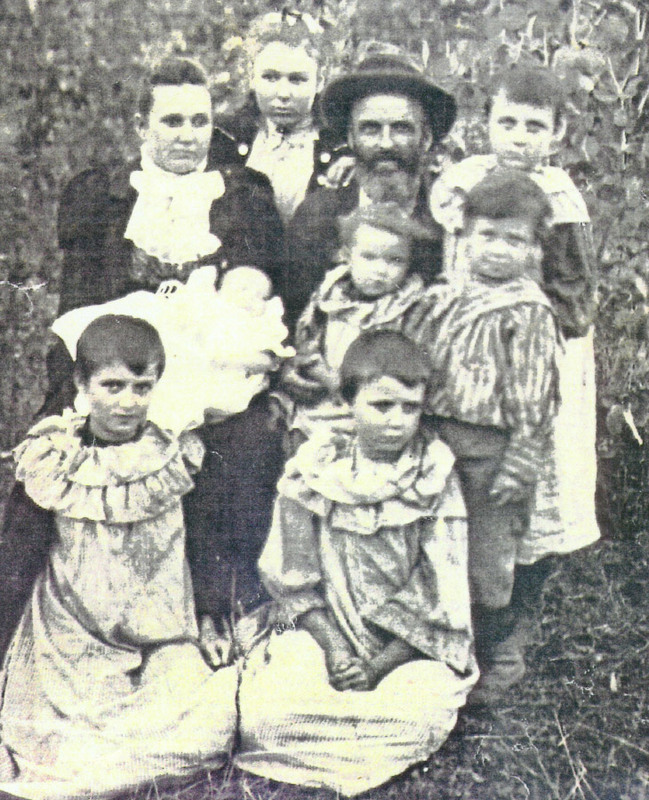 William and Harriet Daniel, with seven of their eight children, at Cadia. Left to right, Back: Harriet, Ada, William and Emily. Middle row: Baby Charlotte, Edith and William. Front row: Grace and Blanche (Isaac deceased). Harriet died from tuberculosis a year after this photo was taken on 8 May 1902 and is buried at the Cadia Cemetery.